Our first real cosplay music video! We always wanted to do something like that and it was so so so so much fun. The filming took part during 2 weekend days at different locations in our hometown. The story is about the three friends from the anime Durarara!! and their friendship. It depicts the problems they have by keeping important things from each other and also the good times they have together. We're very thankful for our friends who took part in the projects as actors and camera and photographers! It was a lot of fun. The editing and cutting was completely done by me. Durarara!! - Masaomi & Mikado Durarara!!-Trio! 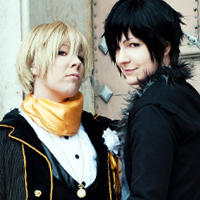 We had the pleasure to cosplay together with our lovely Anri AND our cute Otaku Erika.